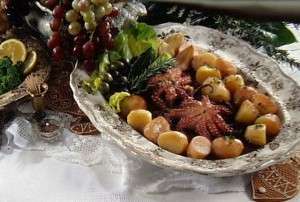 Good food (or “spiza” as the locals say) is an integral part of the Hvar tradition. Healthy, light, mostly boiled food (chiefly fish), seasoned with home-made olive oil and a pinch of herbs which grow wild everywhere, helped down with good wine – this is why the people of Hvar are so healthy and long-lived! Hvar restaurants offer a wide choice of dishes, from the typical tourist menus to a variety of local specialities. As you are here, we urge you to taste some of the local specialities: goat cheese in olive oil; very healthy and tasty wild cabbage salad; “Gregada” – a typical Hvar dish of several kinds of fish, boiled with potatoes; “Pečica na tečicu” – fresh goat cheese fried with sugar; “Rožada” – pudding somewhat similar to Creme Caramel in southern France; home-made “prošek” desert wine; octopus salad; fish soup with rice; baked brass with boiled Swiss chard and potatoes, or mashed potatoes with onion; “Paradižet” – desert made of eggs and milk. You should also taste some of local wines such as Plenkovic or Plancic.